Smart Sport International - Smart Life Institute On Blog Talk Radio! "The health care and fitness worlds can be a challenge to navigate. Join host Allan Besselink in a discussion of current consumer issues related to competent self care, evidence-based practice, and current trends in fitness. 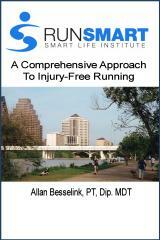 If you are trying to train optimally, prevent injury or are recovering from one, this show is for you." The show will air every second week at the same time. It will also be available as a podcast (including iTunes) and eventually as a videocast. The topic for tomorrow is "What Is Competent Self Care - and Why Do I Care?" Future topics will include health care utilization, training principles, the health care crisis, RunSmart, and many others. Topics and episodes will be posted here and on the BlogTalkRadio site. It may not be "Hitchhiker's Guide To The Galaxy", but "Consumer's Guide To Competent Self Care" wil provide discussion on issues relevant to health and fitness for all!